The final installment of the endless tinkering that went into recreating the F800 series amps into a pedal format. 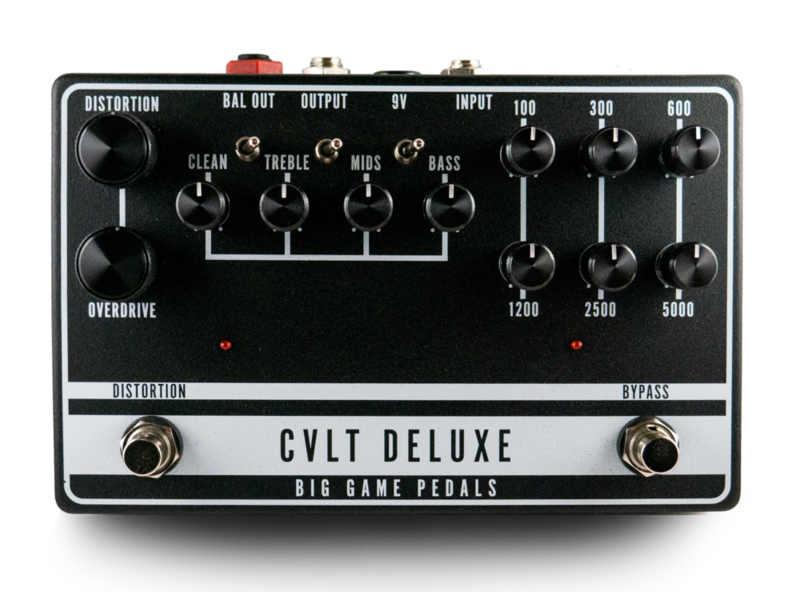 The CVLT Deluxe takes everything from previous versions of the pedal and expands upon the circuit to make an all-in-one preamp, distortion, and tone shaper. The addition of the 6 BAND EQ allows for even more tone sculpting, and the 2 Channels with independent volumes allow level matching and quick changes from clean to distortion. The output is also buffered, which allowed for a BALANCED OUTPUT that can run in parallel with the standard unbalanced output. There will be two color schemes available. Certain moments in every creatures life define it's existance. It doesn't matter if one is looking for these moments or not. Moments such as these are occurring constantly, and it simply takes perspective to see them. Everything can be taken at face value or one can infinitely expand upon these options. In the end, is up to the creature. Everything is Alive is a sound distorter. It is not confined to the label of fuzz, but it can be if one wants it to be. At its heart is a transistor based distorterbuilt upon from the classic fuzz face circuit with added gain staging. After the fuzz is two filters, one controlling the mid frequencies, and the other, a Resonant Low-Pass/ Band-Pass filter. The resonant filter can be manipulated by expression control or a multiple oscillator LFO... or both. There are also CV Ins and Outs for further manipulation. It is the beginning. It is the start of his journey and beginning of new. Sometimes a loud and boisterous push is needed to wake up, and he finds this in a state of solace. Intrusive enough guarantee perception, but flexible to conform to the journey. This is the start and the future is ahead. The Solace State is a preamp pedal based on the early version of the F800 series heads. It features a flexible two-band EQ and is capable of clean tone shaping all the way to a unique ripping distortion. 9VDC Center Negative Only anything else WILL result in a broken pedal, and possibly a smoke.